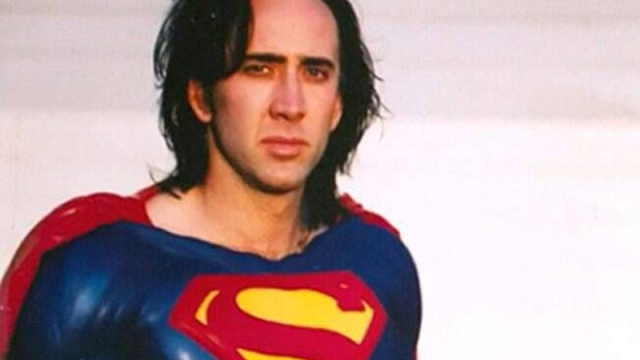 DC Comics news show DC Daily treated its comic-obsessed viewers to the costume that would have been worn by Nicolas Cage in the aborted Superman Lives film. Warner Bros. began developing the film in the mid-’90s with Kevin Smith writing the original screenplay. Producer Jon Peters ensured that Smith’s draft featured a Superman who didn’t fly or wear his trademark red and blue Superman costume, making a more modern and tangible superhero. All versions of the movie were loosely based on “The Death of Superman” storyline from the comics. The main villain was the alien supercomputer, Brainiac, and he had a plot to kill Superman by simultaneously blocking out the sun and unleashing Doomsday on Metropolis. The plot works, and Superman is killed. Later in the movie, he is resurrected by K, who acts as his temporary costume, and artificially produces all of his powers. Subsequent years have seen plenty of leaked behind-the-scenes photos and videos detailing what the film may have looked like. In 2015, the late Jon Schnepp released a documentary, The Death of Superman Lives: What Happened?, chronicling the events leading to the project’s cancellation. The Superman costume displays many 1990s fads including the exaggerated musculature resembling the Batman costumes of Joel Schumacher’s films. Currently the Superman costume has not been displayed with Superman’s iconic red cape and matching briefs in the video but set photos from the production show these classic Superman elements were not going to be forgotten even in this futuristic reboot. Christmas Pet Costumes - Is It Right?